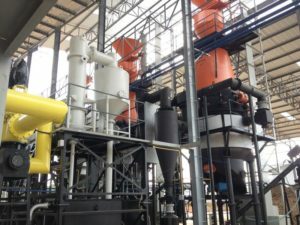 A complete gasifier system includes biomass charging equipment, the gasifier, gas cooling and cleaning system, and control system. 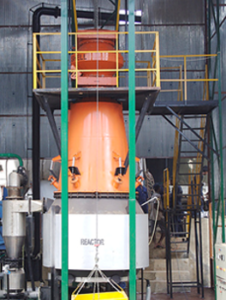 The fuel is batch- or continuously loaded into gasifier using a skip charger or a bucket elevator. The gasifier converts biomass fuel into raw syngas. 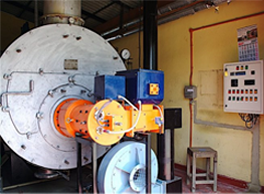 Raw syngas leaving the gasifier contains only low levels of water, tars and a small amount of fine soot and ash particles, which are removed in downstream gas cooling and cleaning equipment. Both WBG and FBG gasifier systems we offer include an original gas cooling and cleaning system which cools and cleans syngas to less than 10 mg/Nm3 tars and less than 10 mg/Nm3 particulates without the need for wet scrubbing and associated tarry waste water formation. Gas cooling generates approximately 150 to 250 ml raw condensate per 1 kg fuel fed into gasifier (exact yield of condensate depends on moisture content in the fuel). An original condensate treatment system reduces the raw condensate to a small amount of wet salts easily disposed of in commercial waste facilities or used as fertiliser. WBG series gasifiers rated from 500 to 2,000 Nm3 of syngas per hour, running on chipped or briquetted wood and “as is” or briquetted agricultural wastes with moisture not more 20%, ash content not more 5%, and ash fusion temperature not less 1,150 degrees C. Some examples of biomass feedstocks and briquettes tested for gasification in WBG gasifiers are shown in Table 1 below. Our gasifiers have been tested with the widest range of biomass fuels on the market. FBG series gasifiers rated from 500 to 2,000 Nm3 of syngas per hour, running on fine wood chips and loose agro wastes with particle size or more 2mm and bulk density more than 100kg/m3 such as rice husk, sunflower or soybean husk, threshed bagasse, mustard and cotton stalks, peach, plum and apricot stones, hazelnut and walnut shells, dry olive pomace and stones, and high density pellets made from any biomass with ash fusion temperature not less 1,050 C. Some examples of loose biomass and pellets suitable for FBG gasifiers are shown in Table 2 below. Our systems can convert many types abundant and low value biomass waste into valuable renewable electricity for sale to grid or on-site use and heat that can be utilised on site. b ) Fine particles less than 2mm should be removed, therefore, grape/olive pomace pellets are recommended. We can supply pellet lines suitable for this material.